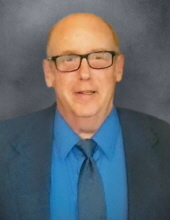 Michael A. Krueger, 59, Denmark, formerly of Lark, passed away on November 28, 2017, with God and his family by his side after a short battle with cancer. He was born March 20, 1958 to the late Meinhard and Sylvia (Brandenburg) Krueger. Mike’s family meant the world to him and he always remembered them on their special days. Mike looked forward to celebrating special days with his family, especially the ones that included a large gathering at Suster’s. Mike loved all of the young kids in his life and enjoyed sharing his treasures with them. Mike was also blessed to have found such wonderful friends as he did at the Danish Villa’s, that watched over him daily, their friendship meant a lot to him. Mike worked at Goodwill for the last 10 years, which was very important to him, and he always gave his best. He is survived by his siblings: Don and Judy Brantmeier, and Norman Krueger. He is further survived by his close family: Kelly (Chad) Vanderloop, Cindy (Shannon) Ossmann, Andy (special friend Mercede) Brantmeier, Jason (Jennifer) Brantmeier. Other nieces and nephews include: Sean Krueger (special friend Lisa), Chad Krueger (special friend Jamie), Jamie (Ben) Blahnik, and Kendra Krueger, as well as numerous great nieces and nephews, whom brought him so much joy and his sister in law Carla. Michael was preceded in death by his parents, and two sisters in laws; Joan (Coisman) Krueger, and Laurie (Klug) Krueger. Friends may call at Zion Lutheran Church, Wayside, after 9:00 AM Saturday December 2, 2017 until time of service at 11:00 AM with Pastor Austen Welter officiating. Please go to www.nickelfh.com to send online condolences to the family. NICKEL FUNERAL HOME, Morrison is assisting the family. Special thanks to Don and Judy for their constant support of Mike throughout the years and to Cindy for taking care of Mike and having that special morning phone call every day. Thank you to Dr. Mark Dehnel and Unity Hospice for giving Mike the special care that he deserved. Also a huge thank you to Pastor Welter for the many visits to Mike throughout his illness and being there in his final hour. To send flowers or a remembrance gift to the family of Michael A. Krueger, please visit our Tribute Store. "Email Address" would like to share the life celebration of Michael A. Krueger. Click on the "link" to go to share a favorite memory or leave a condolence message for the family.